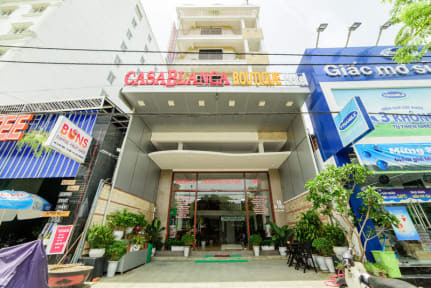 Casablanca Boutique Hotel is located in the heart of Hue City with a cool and quiet atmosphere. Guests can walk to the poetic Huong riverside and the Trang Tien bridge in a few minutes. 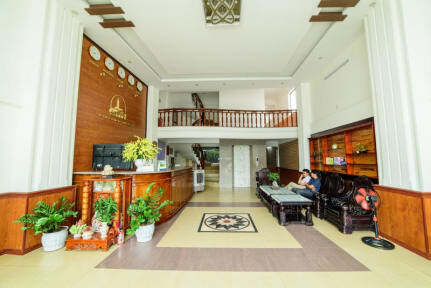 Within a radius of some hundreds of meters round the hotel are banks, post office, stadium, Eurasian restaurant, shops, trade center and leisure center. The hotel provides different sizes of room,Single Room, Double Room, Triple Room. No matter you are a solo traveler or a family tour, you will have suitable accommodation. I had a wonderful stay here! The rooms are well priced and clean and the staff were absolutely wonderful! There are a variety of dishes available for the free breakfast, from scrambled eggs to beef Phô. The lovely ladies at the reception helped us organise a number of activities within Hue and also helped us organise a private car to our next destination. Would definitely stay here again when we’re next in Hue and cannot recommend Casablanca Boutique Hotel enough! One of the best places I've ever stayed! The staff were amazingly helpful, with great English skills and genuine recommendations, not just upselling us on expensive tours. Our (paid) laundry came back nicely folded, and they even got us a discounted one-way motorbike to Hoi An with luggage delivered separately! Good wifi, room was always clean, great breakfast. Location was fantastic, close to the walking street district but away from the noise. Absolutely recommended, will stay again! Very convenient location from where all the action is. Great private room that was clean, comfortable bed, AC accessible, & nice view from window. If you’re looking for a nice peaceful place with great helpful staff in Hue, this is the place. ATM near by also. 100% recommend! Outstanding value for money. It is a hotel though, so no interaction with other guests. Book here if you need a break from hostels. Ladies at the reception are super nice and helpful. The staff here made us feel so welcome and helped us with great local dinner recommendations as well as organising a fantastic day trip in a private car. Could be slightly cleaner but overall a very comfortable stay and great value for money! Nice hotel. I got a private room with comfortable double bed, tv, fridge, ensuite bathroom, for less than $10 per night ! It’s on a busy road but well insulated from traffic noise. Good location and very friendly and helpful staff. Great hotel for the price, clean and comfortable. For me the only let down was the bathroom shower wasnt really working so had to have a bath instead, at least there was a bath! Good breakfast and accommodating staff. Good at looking after all your worries. Best part about this hostel is the staff. AMAZING. Was checking out and they inquired where I was going next. When I told them that they offered to mind my bags. And told me that I could have a shower after my bike ride. They then waved down a taxi for me cos everything was super busy for yet. Hue and her colleagues are the reason to stay here. The staff were incredible here. They genuinely cared about us having a great stay. Only real negative to this place was that there were almost no other guests so didn’t have much of an atmosphere. The staff were absolutely fantastic and breakfast was good - but aside from that, I have no idea how this place has high reviews on hostel world. Room wasn’t super clean - especially the sheets. AC didn’t work well. The location is away from where the other hostels and bars are - only a short walk but still away. Wouldn’t recommend personally.